Taekwon-Do is a Korean art of self-defence. Based on Karate, it is a relatively modern martial art, created by a Korean Army General called Choi Hong Hi in the mid-20th century. Choi Hong Hi was born on 22nd December 1918 (9th November in the old Korean calendar) in the Hwa Dae Myong Chun district in northern Korea. He was born during Japan's occupation of Korea, which lasted from 1910 until 1945, during which time the occupying forces suppressed the Korean people and their culture. At fifteen years of age Choi’s father sent him to learn calligraphy from a teacher called Han Il Dong. Han also taught Choi the ancient Korean martial arts game of Taekkyon, which had nearly died out during the Japanese occupation. In 1938 Choi was sent to Japan to further his education. While there he began training in the Japanese martial art of Shotokan Karate, in which he attained the rank of 2nd degree Black Belt. After four years in Japan Choi returned to Korea, but in 1943 was forced to join the Japanese Imperial Army and was stationed with the 30th Division in Pyongyang. While there he joined with 29 other soldier rebels in a mutinous plot to escape, known as the Pyongyang Incident. When his role was discovered by the Japanese, Choi was imprisoned. Despite the brutal treatment he endured while in prison he practised his Karate and, within a short time, ended up teaching the guards and other prisoners. With the defeat of Japan and the liberation of Korea in 1945 Choi was released from prison, but a short time later he witnessed the division of his country along the 38th parallel, split into the Soviet-backed North and the American-backed South. Choi enrolled at the newly established Korean Military Academy in Seoul, and in 1946 was commissioned as a Second Lieutenant in the new South Korean Army. Posted to Kwang Ju as a company commander, Second Lieutenant Choi taught Karate to his soldiers. He was later promoted to Lieutenant and posted to Tae Jon to command the 2nd Infantry Regiment, where he taught Karate not only to his Korean soldiers but also to the Americans stationed there. It was around this time that Choi decided that, after Japan’s occupation of Korea, teaching a Japanese martial art was wrong and that Korea needed its own martial art. He began to alter and improve the Karate techniques, thereby laying the foundations for what would become Taekwon-Do. Choi was promoted quickly, reaching the ranks of Captain and then Major in 1947, Lieutenant Colonel in 1948, Colonel in 1949 and Brigadier General in 1951. In 1953 he was asked to activate and command the 29th Infantry Division on Cheju Island, where he asked his right hand man, Captain Nam Tae Hi, to begin teaching Tang Soo Do (a Korean version of Karate) to the soldiers. Nam Tae Hi had trained under the Korean Karate master Lee Won Kuk at the famous Chung Do Kwan martial arts gym, and it was with Nam that General Choi would develop Tang Soo Do into Taekwon-Do. In 1954 Choi and Nam finally succeeded in developing their martial art into the modern system that would become known as Taekwon-Do. In the same year, they and fifty of the 29th Division’s soldiers gave a demonstration to South Korea’s dictator president, Syngman Rhee. The president was so impressed with the martial art that he asked Choi to teach even more of the country’s Army, but he was unhappy with the name Tang Soo Do (the name recalled Karate, and therefore the Japanese occupation), and insisted that the martial art be renamed Taekkyon. Choi and Nam knew that what they were teaching was fundamentally different from Taekkyon, and that therefore it would need a new Korean name. In 1954 Choi founded the Oh Do Kwan martial arts gym, with Nam Tae Hi as the chief instructor. In the same year he was promoted to the rank of Major General. The following year Choi arranged a meeting with Nam and the leaders of the other Kwans (martial arts gyms) to try to agree a single new name to replace the various names that were in use. The meeting took place on 11th April 1955, and was attended by Choi, Nam, other Kwan leaders and various other influential Koreans. It was at this meeting that Choi (and Nam) proposed the name “Taekwon-Do”. The name was new and unfamiliar and was not accepted by the other attendees, and an agreement on a new name was not reached. This was, however, the first time that the term “Taekwon-Do” had been used for this new Korean martial art, and the 11th April 1955 is therefore known as the birthday of Taekwon-Do. While the other Korean martial art leaders continued to use names such as Tang Soo Do or Kong Soo Do in their Kwans, Choi and Nam insisted that the soldiers in their Oh Do Kwan call it Taekwon-Do. In 1959 Choi, Nam and many other Kwan leaders agreed to form the Korean Taekwon-Do Association (KTA), with Choi as President; the other Kwan leaders, however, still refused to use the name Taekwon-Do. In the same year Choi published his first book on Taekwon-Do, called simply Taekwon-Do. In 1961 the new president of South Korea (Park Chung Hee) changed the name of the Korean Taekwon-Do Association to the Korean Tae Soo Do Association. The following year Choi was sent to Malaysia as South Korea’s Ambassador, while Nam was sent to Vietnam with the Army, where he taught Taekwon-Do to the South Vietnamese soldiers. 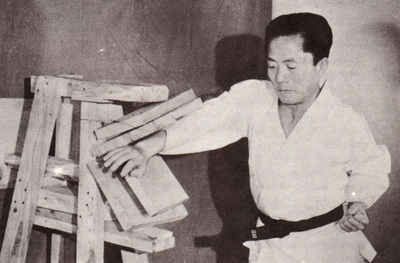 Choi spent much of his time in Malaysia developing Taekwon-Do and creating new patterns, which he called Chang Hon (“Blue Cottage” — his pen name). He also started Taekwon-Do associations in Malaysia and Singapore. He returned to South Korea in 1964, where he continued to develop Taekwon-Do, creating new names for many of the Karate techniques and stances. Two of the big developments that Choi and his students introduced were flying and spinning kicks. In 1965 Choi took a demonstration team on a tour of several countries, including West Germany, Italy and Turkey. The demonstration team wowed spectators with their destruction techniques and amazing flying kicks. In the same year Choi published an English-language version of his book Taekwon-Do for the first time. 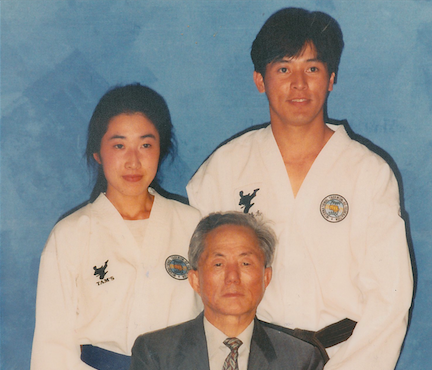 Upon his return to South Korea Choi managed to convince Park Chung Hee to change the name of the Korean Tae Soo Do Association back to the Korean Taekwon-Do Association. Many of the other Kwan leaders, however, continued to teach Karate patterns instead of the new Chang Hon patterns developed by Choi, and continued to use the names Tang Soo Do or Kong Soo Do instead of Taekwon-Do. On 22nd March 1966, with politics clouding the KTA, Choi resigned as president in order to create the International Taekwon-Do Federation (ITF). The ITF was founded with nine member countries — South Korea, Vietnam, Malaysia, Singapore, West Germany, the USA, Turkey, Italy and Egypt — drawn to join by Choi’s demonstration team tour in 1965 and by the first wave of students who had migrated overseas in order to teach Taekwon-Do to the rest of the world. The ITF flag and crest were designed by General Choi and Master Kim Jong Chan (better known as J.C. Kim). The KTA and ITF became rivals, but within two years the ITF was flourishing and had expanded to include 30 countries and millions of members. Politics, however, continued to dominate Taekwon-Do in South Korea and, in a power struggle between the two organisations, the government of South Korea appointed a powerful and influential man called Kim Un Yong (a member of the Korean Central Intelligence Agency) to the position of KTA president in 1971. In the same year Park Chung Hee made Taekwon-Do the Korean national sport, or Kukki. 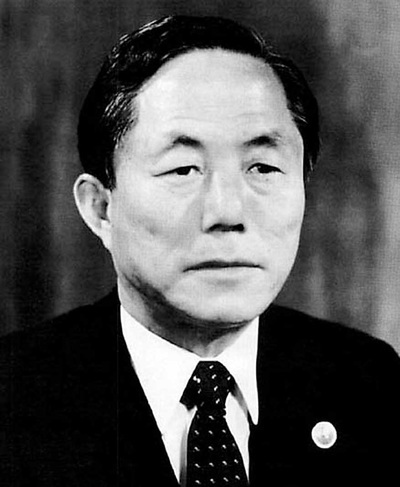 In 1972 Choi spoke out against the dictatorial government of Park Chung Hee and as a result was forced to leave the country. The government dissolved the ITF in South Korea, so Choi and Nam relocated the ITF headquarters to Toronto, where Choi had chosen to live in exile. Meanwhile the South Korean government built the “Kukkiwon” in Seoul to act as the KTA’s headquarters. In the same year Choi published an updated version of his book, incorporating foot-sparring techniques from Taekkyon, in order to give Taekwon-Do a more Korean (and hence less Japanese) flavour. In 1973 Kim Un Yong and the Tang Soo Do and Kong Soo Do masters in the KTA formed the World Taekwondo Federation (WTF), adopting the name “Taekwondo” after recognising the global success of Choi and the ITF. The government banned Choi’s ITF Taekwon-Do from being taught in South Korea, and pressured many ITF instructors and masters around the world into leaving the ITF and joining the WTF. 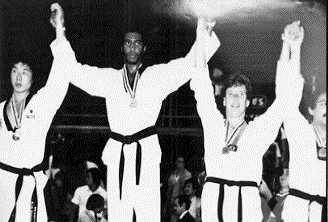 In May 1973, the Kukkiwon staged the WTF’s first World Taekwondo Championship. Choi and Nam responded by staging the first ITF World Taekwon-Do Championship in Montreal in October 1974. South Korea’s reputation reached an all-time low during the 1970s, so it began to use sport, and Taekwondo in particular, to improve its global image. The government decided that hosting the Olympic Games would be the best way to do this, so they aimed to host the 1988 Olympics. Kim Un Yong’s ambition had always been to turn Taekwondo into a pure sport, and in 1980 he began the process of affiliating the WTF to the International Olympic Committee (IOC). Saddened at having the original Taekwon-Do banned from his home country, and having had most of his instructors poached by the WTF, General Choi took a demonstration team to North Korea in 1980 in order to re-establish his martial art on the Korean peninsula. In the same year Choi introduced “sine wave” to the movements of the Chang Hon patterns for the first time. Also in 1980 the Taekwon-Do "tree" symbol was designed by Master Choi Chang Keun (better known as C.K. Choi), Master J.C. Kim and artist Lee Chang Hyup, to go on the back of the new ITF uniform. Ever since the division General Choi had wanted to see North and South Korea reunited, and he saw a unification of the ITF and WTF as a first step towards Korean reunification. In 1982 an agreement to merge the two federations was indeed signed by both the ITF and WTF, but the agreement was never executed by the WTF and the two organisations remained separate entities. In 1985 the ITF relocated its headquarters to Vienna, and in the same year Choi published an exhaustive Taekwon-Do reference book, known as the Encyclopaedia of Taekwon-Do, to document all the techniques that he had researched and developed. In 1988 Choi published a condensed version, since the full fifteen-volume encyclopaedia was too large for students to carry to training. In 1988 Seoul hosted the Olympic Games, with WTF Taekwondo displayed as a demonstration sport (Kim Un Yong subsequently managed to persuade the IOC to bend the rules and include WTF Taekwondo as a demonstration sport for a second time at the 1992 Olympics in Barcelona). Kim became a member of the IOC in the early 1990s, and the Taekwondo of his WTF became a full Olympic sport at the 2000 Olympics in Sydney. General Choi continued to teach Taekwon-Do and promote the ITF until his death on 15th June 2002. Today, the original martial art Taekwon-Do of General Choi and the ITF still remains completely separate from the Olympic sport Taekwondo of the WTF.